A recent project that incorporates bio-inks is intended to address deep skin wounds and the issues that affect their treatment and ultimate healing. The scientists behind it hope that their innovative solution can improve outcomes for these patients while overcoming the problems they face as a result of current medical practice. The skin is the largest organ in the human body with three basic layers: the epidermis (seen on the outside), the next layer called the dermis, and the hypodermis (the deepest layer of skin). People with deep skin wounds are those who have experienced damage to the epidermis and, at least, a layer underneath that. This leaves either the hypodermis or the tissues under it, visible and exposed. People with deep skin wounds are those who have experienced some type of damage that has resulted in the removal some epidermis and at least one other layer underneath that. This leaves either the hypodermis or the tissues under it visible and exposed to the elements. Deep skin wounds are difficult to treat, as it is harder to replace the hypodermis or dermis compared to the epidermis. Furthermore, the wound is at particularly acute risk of infections and contaminations, unless well covered. Such wounds are often termed as chronic skin wounds. They can arise as a result of injuries such as burns. However, other common forms of chronic skin include diabetic ulcers (in which deep skin lesions open and persist due to the effects of the condition), some surgical wounds, pressure sores or infections. These wounds can persist for considerable lengths of time, particularly if there is a comorbid (or co-occurring) condition involved. The current conventional practice for deep skin wound treatment involves split-thickness grafting. It requires the removal of a piece of skin, including all the ‘missing’ layers, from a compatible donor. However, this is often an insufficient form of treatment. 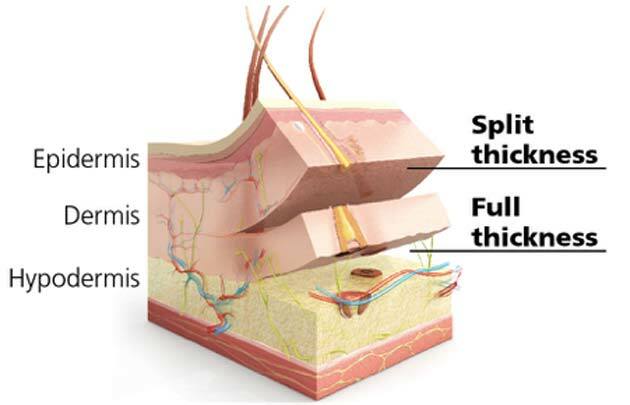 The split-thickness graft may be inferior in terms of surface area compared to the actual wound to be covered. Therefore, the said wound may remain partially uncovered following graft placement. Graft sizes are often limited in order to manage the risks to the donor involved in their removal. For example, a large graft-donation site may itself become a chronic skin wound, sometimes. Despite these issues, split-thickness grafting remains the last resort, if alternative treatment, which includes deep wound irrigation, dressing, and frequent cleaning, fails. Therefore, medical researchers and tissue engineers are constantly looking for new options in chronic wound treatment that can be developed into a viable clinical product or technique. An up-to-date example is a bio-ink-based innovation. This was developed by researchers at the University of Toronto, in collaboration with others from the Ross Tilley Burn Center/Sunnybrook Health Sciences Center and Sunnybrook Research Institute in Toronto. 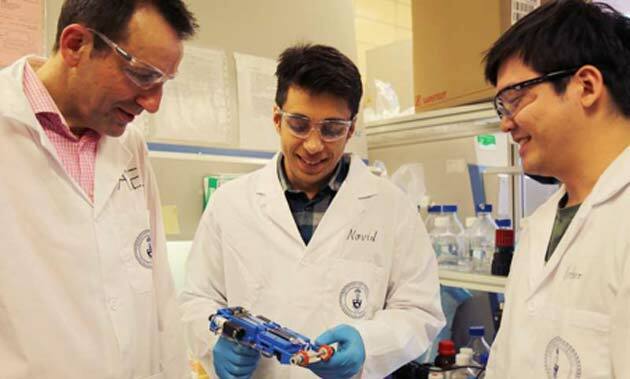 The result of their work is a form of 3D printer that deposits new skin cells into a deep-thickness wound. The cells are also suspended in a mixture of bio-neutral polymer and proteins that ensure the distribution of the cells into uniform layers. Furthermore, the team’s new printer has been designed to be portable enough to carry to the patient and treat them with the bio-ink. In fact, the machine looks somewhat like a cross between a price-sticker gun and a white-out dispenser. It ‘prints’ the bio-ink in thick stripes that could cover a wound in a minimal number of passes and sessions. Also, the skin printer weighs just under a kilogram and may be manipulated with ease in cases of complex wound thicknesses and shapes. It deposits epidermal or dermal cells in conjunction with the polymer alginate, which provides chemical cross-links for ink stability and cohesion. The team also incorporated into their model - hyaluronate (present in the skin as a space filler and has biochemical properties), fibrin, a protein that promotes healing and integrity among cells, and collagen (which links cells, in vivo). The team demonstrated the bio-ink printing process onto agarose substrates in the course of in vitro testing. This process confirmed the ink’s ability to be extruded in narrow sheets that were consistent in terms of cell (and other molecule) content, width and thickness. These tests were followed by in vivo studies, which applied the entire 3D printer to deep skin wounds in experimental pig and mouse skin. The group of scientists demonstrated that the bio-ink stripes could cover the wounds in their entirety, whether they were angled away from the horizontal (as they might be in living animals) or not. It was also observed that their new printer worked in the presence of simulated breathing, as part of the in vivo trial. Currently, these cases are about six million in the U.S. alone, which are associated with a healthcare resource burden of approximately 20 billion dollars per year. The study also featured in a paper published in the journal Lab on a Chip in 2018. N. Hakimi, et al. (2018) Handheld skin printer: in situ formation of planar biomaterials and tissues. Lab on a Chip. 18:(10). pp.1440-1451.